DirecTouch is Sable's innovative new restaurant-management system, integrating elegant flat-panel touch-screen PCs with cash drawers, printers, card swipes, customer displays, and other peripherals. Numerous standard and optional application modules are available, and it comes in both Windows 98 and NT versions. Each is cost-effective and tailored to your individual needs. No needless, enforced options. You get what you want, not what someone else thinks you need. Concerned about capacity? 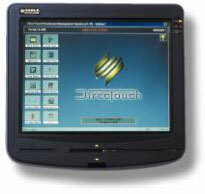 DirecTouch can handle multiple menus with up to 3200 items and modifiers per menu. Modifications are automatically reflected at all workstations. Servers receive valuable on-screen prompts and modifiers to assist in ordering and incentive selling. Time limits on menu groups and individual-item tracking and countdown facilitate monitoring of limited-quantity items and specials - no need to apologize for selling something you no longer have. Discount, void, coupon, voucher reporting by server, authorizing manager, and item. You can now limit wrongdoing and unnecessary financial loss while simultaneously taking special care of your regular customers, VIPs, and colleagues. Of course, DirecTouch also provides for custom-designed reporting utilizing user-selectable parameters. And, all reports are exportable to standard database formats and spreadsheets. You recognize the necessity of controlling your business, especially when you can't be there, so DirecTouch provides the ultimate in security, tracking and auditing. Password and mag-card security; optional picture-ID display at sign-in; and selectable security requirements for up to 15 features including voids, discounts, bill reprints, automatic gratuities, on-account items; server sign-ins/outs; credit-card features; transfers and reopening of orders. Add features such as screen time-offs for management-only functions, multiple access levels, audit trails of all attempted and successful entries into the system, and automatic replication of the data base every 30 seconds to another server - together they spell peace of mind. DirecTouch offers many other valuable features such as the Fast Bar Option for popular libations, a Pool Table and Internet Time Tracking module, and a Delivery, Catering, and Take-Out Services module, to name just a few. All of our products and applications contribute to the growth, profitability, and popularity of your business, because our business is providing better solutions. And more solutions. It's what we do.